The “holistic” vision of cross-platform TV. The new NGX paradigm: very high definition for images, audio and interactivity. Rome, 19 December 2017 – A new leading-edge contribution on the “Vision of the TV of the Future” is announced today by HD FORUM ITALIA (HDFI), with the release of Ultra HD BOOK 1.0 – Unified Volume, prepared in collaboration with Confindustria Radio TV (CRTV). This technical compendium is the latest in a series containing specifications for manufacturers of television receivers, to meet the requirements of the multi-platform TV system in Italy. As a result of the activities of the Joint Technical Group (a technical body set up within HDFI), the Book is a breakthrough contribution to the development of Ultra HDTV, in the frontline promoting the uptake of international standards that include new image (HDR, WCG, HFR) and sound (NGA) technologies. The Ultra HD Book 1.0 – Unified Volume represents a new generation of specifications that considers a “holistic” television through the cross-platform concept – satellite, terrestrial and broadband – to guarantee to the users a unique, integrated, innovative and engaging experience, thanks to the extremely high definition of images, the immersive sound of latest generation and the performance provided by the interactivity with HbbTV 2. The collection of technical specifications will guarantee consumers with a choice of innovative and durable technology, also in view of the technological changes concerning the first generation of terrestrial digital television, which will take place in 2022, so as to provide manufacturers with useful indications to introduce compatible TV receivers in the Italian market. Particularly innovative is the definition of the NGX paradigm – Next Generation Experience, meaning that Ultra High Definition, along with HDR, WCG, HFR, NGA and HbbTV 2 technologies, is a formidable mix of advanced solutions, applicable to video-shooting systems, to related audiovisual production equipment, to content already available in dedicated libraries, to TV receivers and to new generation screens. Solutions, which altogether show and stimulate a renewed user experience for the use of, and interaction with, contents and services. 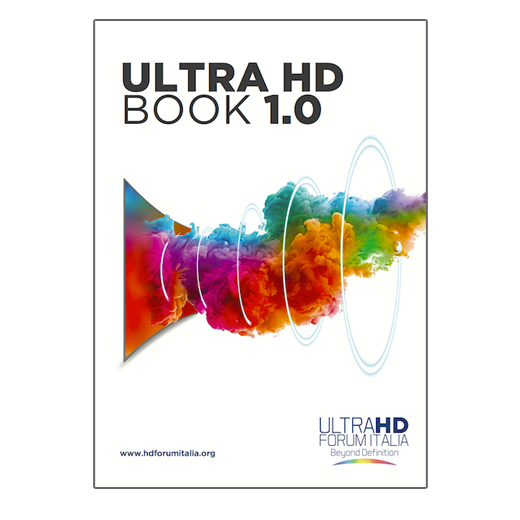 “HbbTV association congratulates HDFI on the publication of UHD Book 1.0 – Unified Volume. The Association is excited to see the first specification that brings together broadcast UHD channels with HbbTV services. The Association is pleased that the UHD Books 1.0 includes all of HbbTV 2, which will strengthen its global rollout”, said Klaus Illgner, Chair of the HbbTV Association. Founded for the purpose of promoting, supporting, presenting and disseminating the use of audiovisual and multimedia content, as well as high-definition products and technologies, the Association HD Forum Italia has followed the evolutionary path of High Definition, by producing important technical literature that gave rise to what we called HD Book collection: a series of guides, protocols and documents with specific recommendations that over the years have become a precious compass for broadcasters and manufacturers.